If the images above are to be believed, Apple's newest iPhone model will boast an aesthetic nearly identical to the company's existing top-end iPhones, a design launched in 2014 with the iPhone 6. The supposed leak comes courtesy of Steve Hemmerstoffer, who received the drawings from an unnamed source in Apple's supply chain. 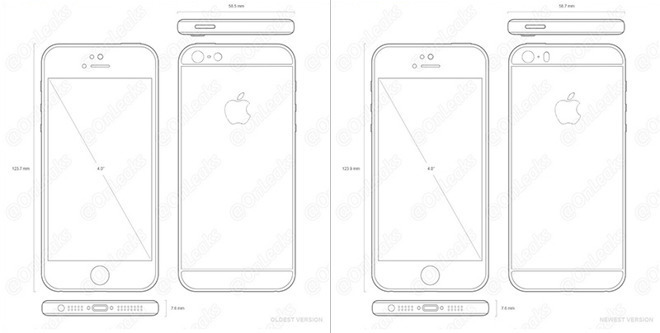 A closer look at the schematics reveal an amalgamation of iPhone 5 and iPhone 6 hallmarks, including separate porthole groupings on the bottom of the handset accommodating the loudspeaker and main microphone. Confusingly, the "oldest" prototype version shows a round True Tone flash module mirroring the compact component introduced with iPhone 6, while the "newest" drawing switches to the generations-old pill-shaped design. The newer prototype also deletes two loudspeaker portholes ostensibly to attain design symmetry on both sides of the central Lightning port. Not much is known about Apple's reentry into the 4-inch smartphone market, though rumors surrounding the device have been floating for almost a year. In the intervening months, reports have slowly found consensus on internal specifications, with the most recent claiming the new 4-inch model will run a variant of Apple's latest A9 SoC. In addition, reliable sources revealed late last year that Apple is incorporating Touch ID and Apple Pay into the phone. The latest scuttlebutt suggest Apple will announce the new 4-inch iPhone alongside a third-generation iPad Air at a special event on March 15, with both devices rumored to go on sale three days later.